This post is filed under Carrots, Cherry Crisp, Chicken, Corn, Frozen, Healthy Choice, Microwave, Peas, Potatoes. You’ve got to be kidding with the looks score. It’s not anywhere close to the way it looks on the box. The cherries are deflated goo, with what looks like a splash of cottage cheese on the top. The mash potatoes are mush and are missing the opaque-looking gravy with evenly sprinkled pepper. 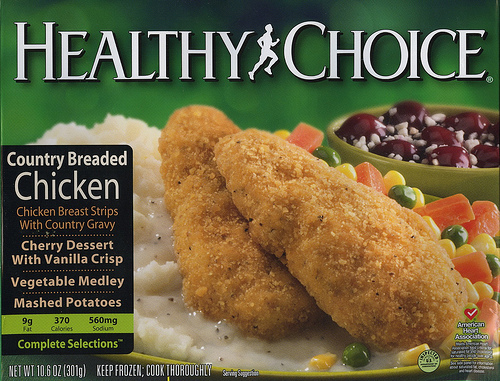 The chicken pieces don’t look as fluffy and textured – they look like someone stepped on them. And the mixed vegetables are mostly corn. The whole plate looks like a load of crap. I would personally rank it a 1 out of 5. Not because the picture on the box looks appetizing, but because the actual meal looks that bad. 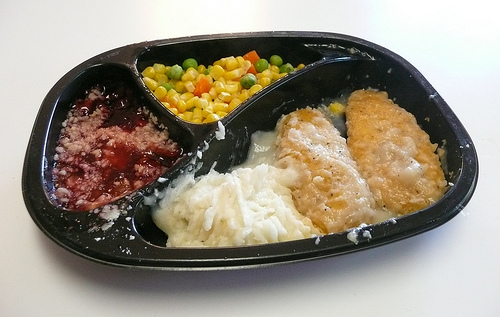 Eugh, utter slop… it would take a shorter time to cook a proper meal than blast this crap in a microwave. is this an american brand?